Glory is fleeting but obscurity is forever. 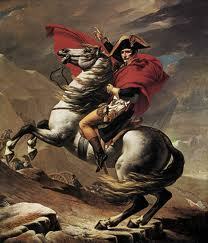 A great quote from Napoleon Bonaparte. Admittedly, it all ended pretty badly for him on a godforsaken island in the South Atlantic but I am sure on a clear day the views were almost spectacular. The reason I use this quote is I was recently reading Dave Trott’s remarkable and excellent book Predatory Thinking. In one of the chapters he talks about how marketing departments always want to grow and to do that they need to take somebody else’s lunch. To survive they have to win. Advertising agencies are no different. And to win, you have to attack. You have to beat the opposition. You have to have a better plan of battle otherwise you die. Many don’t like to talk about this because it is brutal. But this is the truth of our business. And those that succeed, fundamentally understand that unless you attack at some point you will never win a battle. Or, to put it another way you cannot succeed unless you are prepared to fail. These days waiting for the battle to come to you is not a formula for success. I listen to many talking about defending their way to glory.They use large words and have many intricate strategies with colourful pie charts. Well, in the words of Mike Tyson, everybody has a strategy until they get punched in the face. Our business is littered with examples of people who have tried to just hold on to what they have and failed dismally. And if you want an example of this outside our business I will give you one. Kodak. It blows my mind that a company of that size can die. The strangest part of their demise is they invented what killed them. They had a digital camera in 1976 but didn’t develop it because it would threaten their core business. They were right. I think some in our business are going to succeed and some are about to experience their own Kodak moment. Jack Welch said if the rate of change on the outside exceeds the rate of change on the inside, the end is near. Well, I would say the rate of change is so fast right now by the time you have put up your defences, your own army has moved. Or the weapons have changed. Or the battlefield is somewhere else. I honestly believe attack is important simply because it creates movement. It does not guarantee success but it creates a target and energy. And most importantly, you might get to a better position than you are in right now. Defence at best guarantees the status quo. As a strategy these days, that is not an option. To attack takes a large amount of bravery and daring. And even if you have buckets of both, there are no guarantees. What I do know however, is that people are normally remembered for what they tried to do. Very few are remembered for doing nothing. It was called the Charge of the Light Brigade not the defence of the Light Brigade.They were celebrated because they gave it a go, the nobility of trying, instead of waiting for someone else to decide their fate. In the past, it always came down to that choice of defend or attack. I think these days, that choice has gone. → Glory is fleeting but obscurity is forever. Predatory Thinking is the best book I’ve read in years. Trott is an old school writer who totally gets the 21st century culture and the golden thread that connects Bernbach to Banksy. And you’re right about there being no choice left. Attack, be nimble, be persuasive and embrace risk. All the things the corporate world embraces. Not. Defence is not an option. Retainer-based income is a musket in an automatic weapon battlefield.